One of the most recent entry to the Mariner range the 6HP short shaft engine which carry on the tradition of offering big motor features with small motor economy. The engine has been designed with ease of use in mind with very smooth acceleration and a twist-grip throttle on the tiller. It also comes with the largest displacement powerhead in the class and a 5 year warranty for leisure users as standard. 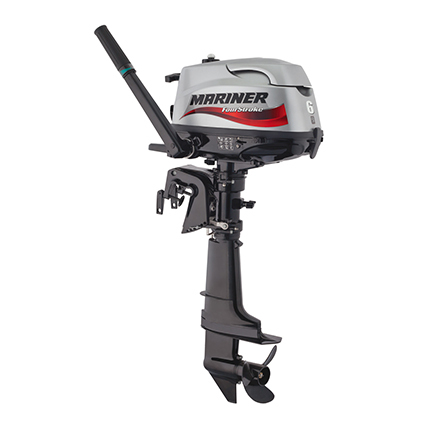 This outboard engine is still only 25KG and hence can still be lifted easily and provides that extra bit of power that is often very handy. It is also the largest HP of the single cylinder engines so is a very popular with tender/ inflatable owners and as a back up engine. Through prop exhaust buries the engine noise underwater for even quieter running.